I recently asked readers to submit their burning leadership development questions. Those that get picked for a post will receive a free copy of my eBook. I love this question! It’s simple, to the point, and really makes you think. 1. Most managers (people in leadership positions) really don’t read books about leadership. Even if there was a way to find out how many managers there were in the world at any time, I’m sure that number would be way bigger than the number of leadership books sold. I ask new and current managers all the time how many leadership books they have read in the past year, and most of them, if they are being honest, haven’t read a single one. A lot of them may have actually purchased a book or two, and display it in their bookcase, but the pages don’t look like they’ve been turned. 2. They are reading the wrong books. Many of the bestselling books in the leadership & management section in Amazon are written by successful business leaders, like Steve Jobs or Sheryl Sandberg, but being a very successful business person doesn’t qualify you to be an expert in leadership. For all of his visionary genius and contributions to society, many believe that Steve Jobs was a horrible role model for leadership. That’s not the book I’d want to hand out to my management team to teach them how to lead, but I know of a few CEOs who have. This one’s actually wrong, but it doesn’t stop people from coming up with new models and theories of leadership every year, each one claiming to be better than the other guy’s. This is where the expression “leadership by flavor of the month” comes from. 4. Reading doesn’t always translate into behavior change. There’s a lot more to leadership development than reading a good book or two. Yes, understanding the “what” and “how” are a good start, but it takes years and years of training, continuous practice, feedback, and more practice to get really good at it. 5. Most managers (and people) have no idea how they come across to others. 6. Many managers are promoted because they are really good at something other than leadership. It’s the same old story – organizations promote the top sales person to a sales manager, even though the behavioral profiles for a successful sales person are almost the opposite of a successful sales manager. Then, instead of approaching their new role like a new profession, they just keep doing what they have always done that’s made them successful. 7. Because leadership is really hard! Really, it’s not as easy as it looks, or as easy as the books tell you it is. Leadership roles are chock full of dilemmas with no clear cut answers. These are highly visible positions, which magnify every mistake. I also think managers are often held to an unrealistic standard when it comes to leadership, standards set by all of those leadership books out there that describe the 72 things a leader has to be great at. Ask a group of 20 people what “leadership” means, and you’ll get 20 different answers. So if there is no universal, consensus definition of what leadership is, how the heck can we assess if someone is good at it or not? Managers will often read a good leadership book, or attend a training program, and get all excited about trying out some new leadership behaviors. However, when they do, they are directly or indirectly punished for going against the norms of an organization’s culture. Culture eats books for a snack. 10. Useful doesn’t always mean used. I recently attended a fascinating webinar by MIT Sloan Professor Nelson Repenning that explained why proven capability building processes and tools like LEAN and Six-Sigma often go unused. I think it may help explain why when a manager learns a new leadership skill – then tries to use it, expecting immediate improvement and doesn’t get it, they give up and go back to what they are comfortable doing. It’s not just that leadership is hard and takes a lot of practice – it’s that we need to set the expectation that anytime we try something new, our performance will actually drop in the short term, but improve in the long term. People and organizations are psychologically biased towards short-term results, and don’t have the patience or tolerance to do what it takes to build long term capability. I’m sure there are other reasons – please leave a comment with your thoughts. Note to Kathy L. – if you’d like a free eBook, please get me your email address. Hi Dan, great post. There is no right or wrong method to follow inorder to excel in leadership. One needs to take time to reflect on their own behaviour and how their team members perceive it. Getting continuos feedback and working upon it will change the way you lead your team. I agree with you nobody becomes a leader overnight it takes years to become a leader from a manager. Most organizations promote people beyond their capability. Personality of the employee is more influential than the potential that the employee has. There are plenty of theories, traits and techniques to use, but the bottom line is that everyone who is a leader has to be out front and be held accountable while holding others accountable. We want the fame and glory, but not the burden of responsibility that comes with it. Thanks for the article and I'll be sure to share this with my team members. Thanks for your comment, and for sharing it with your team members! The perception prevails that strong leadership is based on intelligence, but forget the critical importance of emotional intelligence (as per Daniel Goleman's five key characteristics of EI). and the need for a strong moral compass. For some interesting reading, Google Chris Argyris' classic piece in the HBR "Teaching Smart People How to Learn." This is an interesting and complex question. One could write books on this (and many have). Briefly, the answer may lie somewhere in the mix of challenging and rewarding. Leadership is all about change. Management is all about control. Leadership is all about taking people from Point A to Point B. Defining Point B, selling Point B, building an engaged team to achieve Point B, aligning that team around the vision of Point B and being there to provide inspiration when the team inevitably hits the hard parts is what leadership is all about. People are resistant to change and most are dying to be led, a dichotomy that is part of the leadership challenge. All of this is above and beyond “getting the job done.” Management is about getting the job done -- processes, procedures, producing quality time and time again, timelines, and budgets. This is how senior management extends their control. This is where senior management focuses its rewards. Corporate America is under led and over managed. When you add the fact that there is too little coaching going on, it is no wonder that managers are often poor leaders. I'd add they've seen bad leadership modeled so frequently they don't know good leadership when they see it. Thanks for highlighting some inconvenient truths about leaders and leadership. One main reason I see quite a few of my clients, leaders, perform poorly is because of persistent self-deception. That's why we need more candor in the workplace and in coaching. Thanks, I'll take a look at it! Thanks , yes, no wonder indeed! Nice comments. All missed what I believe is the critical factor: Leadership development in the business world starts too late. To make my point I will simply quote Jim Collins, who holds a 2 year appointment to West Point's Class of 1951 Chair for the Study of Leadership. He stated that his time at West Point had given him a new appreciation for some aspects of leadership that he had not previously thought much about. "I have come to see how important it (frontline, or unit-level, leadership) is. We tend to think that what matters is having outstanding leadership at the senior level. But great leadership at the top doesn't amount to much if you don't have exceptional leadership at the unit level. That's where great things get done." And that is when one is a supervisor or before, definitely not yet a manager. I am a firm believer that the best leaders are led by a set of internal and external core values. They know they who they are and the kind of character they want to possess. They also understand the values (culture) they want their group or organization to have. They are passionate about pursuing both. Also, there are blind spots and then there are BLIND SPOTS. Good leaders are at least willing to have people discuss with them how they should change to be a better leader and to help the organization be better. Then there are the leaders who won't listen or believe it even if they were being told with a million bucks. Thank you Dan. I really enjoyed this post. What stood out for me the most was your last point. Leadership is complex, hard and takes time to get results. I have also seen performance drop in the short only to rebound down the road. Thanks again for the article, it got me thinking! I think all of the above mentioned points are all good points. I like the distinction between management and leadership that one person made - and then I ask why do either of those approaches fail - and it always comes down to relationships and how one person responds to another - as object or as human being - which in turn causes the other to respond in like manner. Why are we afraid to interact with others as human beings, and be vulnerable and compassionate while at the same time stay focused on the mission of the organization/group/team or department. Dan, you're right--that was a great question. Your answers were equally great. Another reason we don't have better leaders is that to improve as a leader, one has to both recognize the need to improve. That stops most leaders. It's not that they would say there is no room for improvement--it's just that they think they're already a good leader--and there's no urgency to change. The lack of feedback you mentioned is one reason leaders overestimate their effectiveness--the irony is that lack of feedback is a sign of an ineffective leader. Thanks for your comment. Let's hear it for the frontline leader! Thanks, glad it got you thinking. Thanks. And great comments too! I agree with all points, but #5 really resonates with me. So interesting that we are hypersensitive to it in others and all but oblivious to in in ourselves. A tool for increasing one's ability to be "self aware" would greatly increase the effectiveness of many of those in leadership positions, provided they they are open to the feedback they might recieve. Thanks! Right, there are a lot of good tools out there, from personality assessments to multi-rater assessments. A combination of them, along with a good debrief, works the best. I find this post somewhat contradictory in terms of its message vs the author's practice. The article talks about how leadership can't be gotten from a book or seminar (which I completely agree with), yet the intro paragraph to this blog post offer's the author's free ebook on leadership. 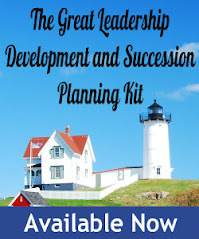 Not to mention the other leadership books promoted on this site. Is that not contradictory to the message and points of the blog post? I don't recall ever saying that you can't learn leadership from books or seminars. The point I was trying to make (that may have been misinterpreted) was that you can't develop as as leader by those methods alone. You are right, if I was to, it would be contradictory, as writing and training are a big part of what I do. Most so-called experts tell us leaders are made, not born and that anyone can learn to be a successful leader. Do you agree? Answer this question- Is there financial gain to saying leaders are made, not born? Books and seminars perhaps? You can visit play grounds across the world and you can identify the leaders among the children. When you were a child, did you decide what you and your friends were doing? Some people are born with traits that make them natural leaders. Trait theory of leadership has a validated history, but seems to be overlooked for situational or transformational leadership. Perhaps due to the financial advantage? With over 24 years of military and law enforcement experience, it is my position leaders are born, leaders are rare and most people in leadership roles are managers, not leaders. At least all the training makes managers tolerable in their leadership role. 1. "Most so-called experts tell us leaders are made, not born and that anyone can learn to be a successful leader. Do you agree?" Leaders are somewhat born (intelligence, energy), but mostly made. That's not just an opinion, it's based on sound research. However, it takes LOTS of hard work (read "Talent is Overrated"). 2. "Is there financial gain to saying leaders are made, not born?" Yes, there is, no doubt. 3. "When you were a child, did you decide what you and your friends were doing?" Sure, sometimes, but being bossy or the alpha kid is only one narrow aspect of leadership. Interesting you should bring up your military career, which I have a lot of respect for. I always thought the Army and Navy provided some of the best leadership training/development in the world. Why bother if it's all trait based, and they could just select officers based on some kind of genetic test? Even though I believe leaders are born (Trait Theory), I am not saying they do not require any development. First off, one of the traits is a desire for self improvement; resulting in the person seeking to expand his/her skills, knowledge and abilities. It is my position that Americans began ignoring the fact that not all men/women are created equal (check the locker rooms), everyone gets a trophy (win or lose), we stopped having a valedictorians (hurts the losers feelings), virtually everyone graduates high-school (reading or not) and now anyone can be a leader; it is just not true. If you really research it, check the actually scientific studies and history and stop pandering to mediocrity, you too may be a Trait Theory believer. This will be my final rant on the Trait Theory. The point I am trying to make is there are many excellent managers that are using sound leadership and management principles developed through education and training. These managers are competent, capable, respected and valuable assets; however, it doesn’t make them leaders. Why are we so determined to say anyone can be a leader? Are we truly so conceited that we refuse to acknowledge the natural traits of others? Why can’t we settle for anyone can be a great manager? Think about all the supervisors you have had over your lifetime. I am certain you had good, bad and even some great ones, but how many were actual leaders, not great managers, LEADERS? Liking, respecting and appreciating your supervisor doesn’t make him/her a leader. Thanks again for sharing your thoughts on Trait Theory. The comments have good content and the article has interesting content and thought-provoking implications BUT I am very disappointed with the title. When did it become acceptable to disrespect, slam, and degrade people (Managers) who work hard for a living (even to catch headlines)? While I agree that not all Managers are remarkable leaders (not all leaders are remarkable Managers either! ), I do not believe that most Managers are clueless about leadership! I have yet to see anybody rise up and be the best they can be by being beaten down so why do we glorify a villainous question? Thanks for your comment, and I appreciate your feedback. I'm glad you found the content and comments interesting. As for the headline, no disrespect intended. This blog has never been about "boss-bashing", it's always been all about helping managers/leaders grow and be successful. With 24 years' experience as a military leader and a Masters in Organizational Leadership, I submit leadership is not hard. "Leadership is the process of influencing others to accomplish a task by providing, purpose, motivation, and direction." When we simplify this base definition (courtesy the US Army), we find that successful leadership boils down to a relationship between the leader and the led. Leadership Development for 5 Year Olds?